Excuse the diminutive, but it always seems to me that Mariel4 and I ought to be grandmothers to you and Frances5. Well, Neddy, its not half so bad as I feared. They6 are not the infant damnation sort of Presbyterians at all, in fact their church7 split off from the other church because of its more liberal 2 interpretation of the creed regarding predestination and the "summary treatment of infants" as Mr Axtell8 calls it. He means to be a jolly man and is an awfully nice one, but fun does'nt come natural to him. He has told me all about Lyda's9 over-zeal and their worry over her. He seems to look at it quite sensibly. But everything is church here. When they have parties they invite the members of their Sunday school class! 3 I inadvertantly told Mr. Axtell that my folks10 were Baptists—I had to say something—and alas, the Baptist minister lives next door and in ten minutes he had him over and upon me. Pity me! Miss Rush11, one of Lyla's five thousand seven hundred cousins, was over to dinner yesterday. She is going to Vassar12 with Lyda this fall and was talking about the work required in various universities. I told her how many hours I usually carried at 4 the U U. of N. The dear thing looked up in sweet surprise and said innocently, "What, how did you ever find time with your newspaper work13 and church work?" My church work, O Neddy! Here every girl has her church work just as other girls have fans or powder boxes. We went of an organ recital by William Archer14 at the great Carnegie music hall15 Saturday night. It was great. I never heard Schumann's16 6 "Traumerei"17 on an organ before. 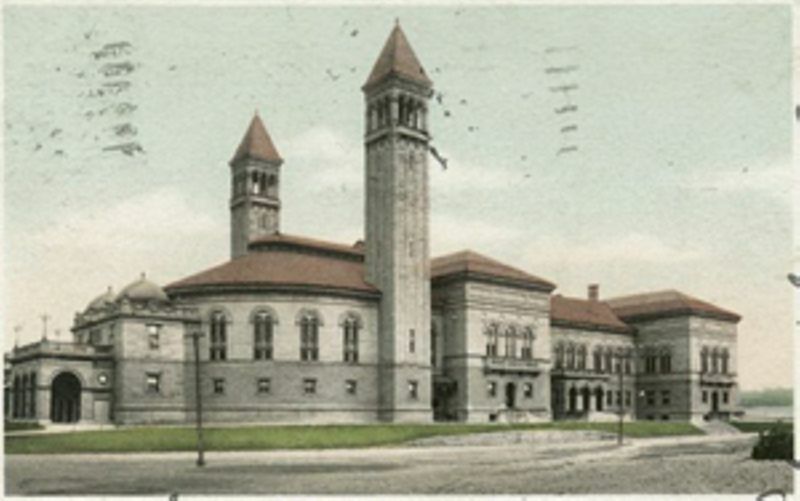 The music hall is in the same huge building with the Carnegie library and art gallery. I thought the U. of N. Library was insight[?] nice, but this—its marble from one end to the other and then the colors and frescoes are just one artistic harmony. It is only a short distance from the office and they have all the books in the world there I think. And right near it is the Casino theatre18 and 7 my old friend Pauline Hall19 plays there all next week. I foresee alas, that I will not go to the library on matinee afternoons but will slip across to the Casino to look upon Pauline's glorious anatomy once again. The old Nick is in me Neddy, its no use talking. The Axtells are awfully nice, but they are chilly as a wine cellar and sort of formal even with each other. I cant express it, its just the old infant damnation business. Phillip20 8 is a comfort, for he is little at least. Because I come from the West he expected me to tell him Indian stories, and I fulfill my role in a way that would convulse you could you hear me. When I get through going to church and telling Indian stories I will have no more sense of truth left than Carlyle Tucker21. I went to Church with the Axtells and their relatives, who comprise the entire population of East 9 Liberty, last night. 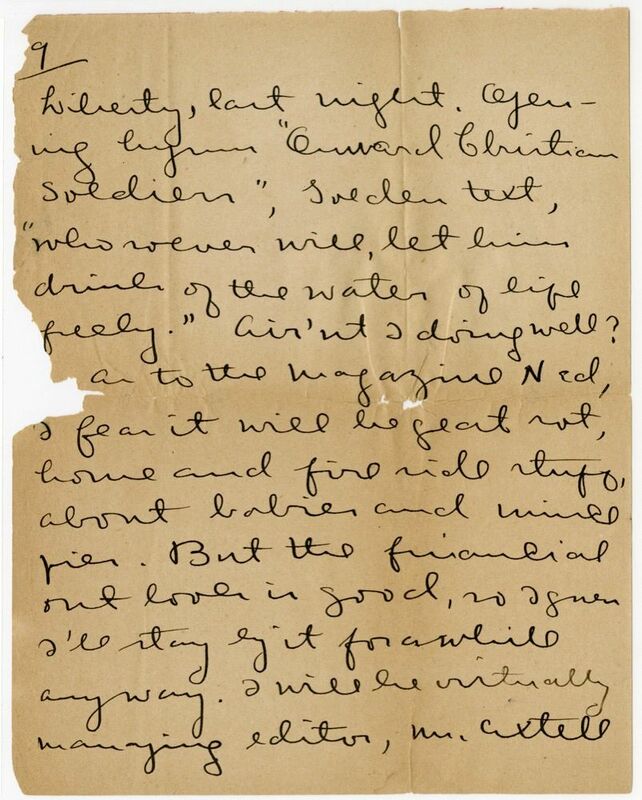 Opening hymn "Onward Christian Soldiers"22, Golden text23, "whosoever will, let him drink of the water of life freely." Air'nt I doing well? As to the magazine24 Ned, I fear it will be great rot, home and fireside stuff, about babies and mince pies. But the financial outlook is good, so I guess I'll stay by it for a while anyway. I will be virtually managing editor, Mr. Axtell 10 and I being the only people who have anything to do with the literary de part of it. During his month of absence I am to have sole charge. The proof reading goes all right, I found four mistakes he passed over this morning. I have a nice desk etc. of my own. Write to me soon and tell me if Mr. Oury25 goes to help the Cubans or gets killed or anything. He is real nice, is'nt he? 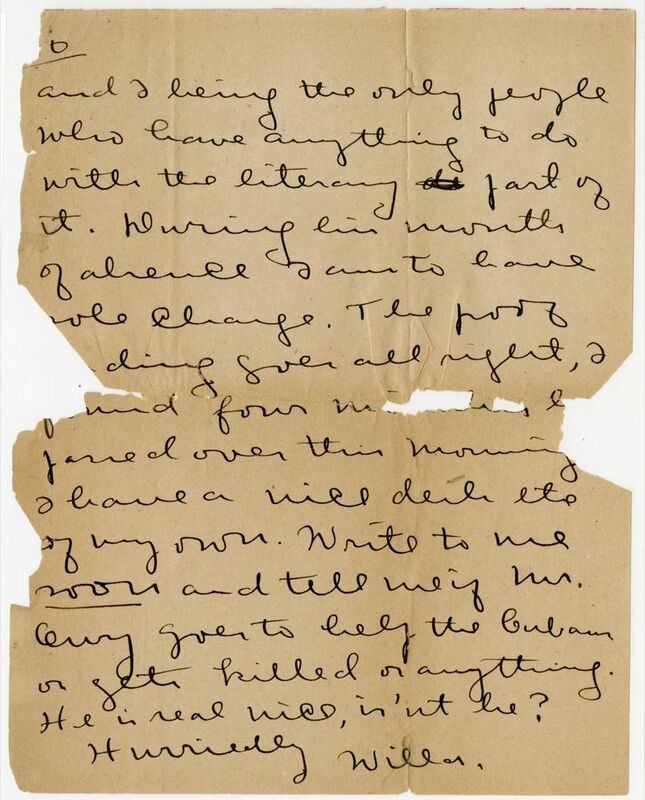 Document is nine leaves, handwritten on recto only of each leaf. 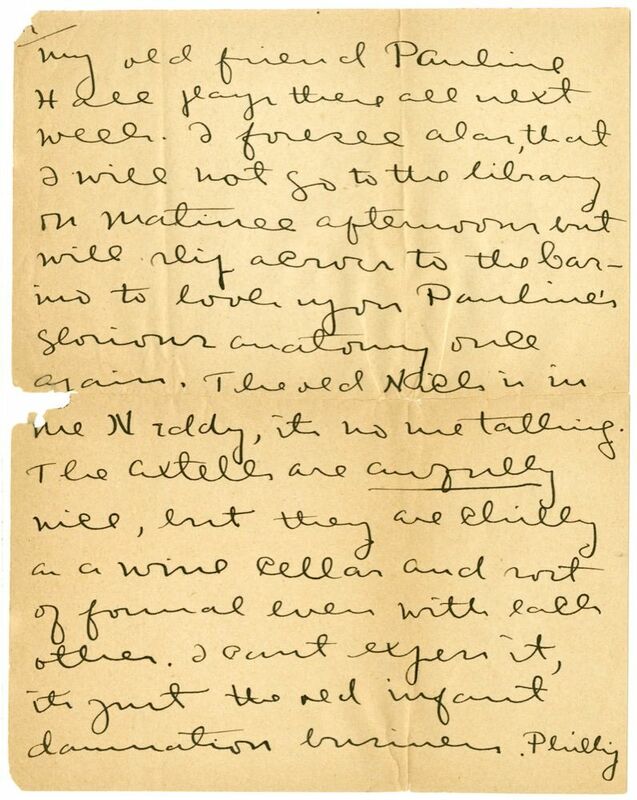 The Archer Organ recital mentioned in this letter happened on Saturday, June 27, 1896. 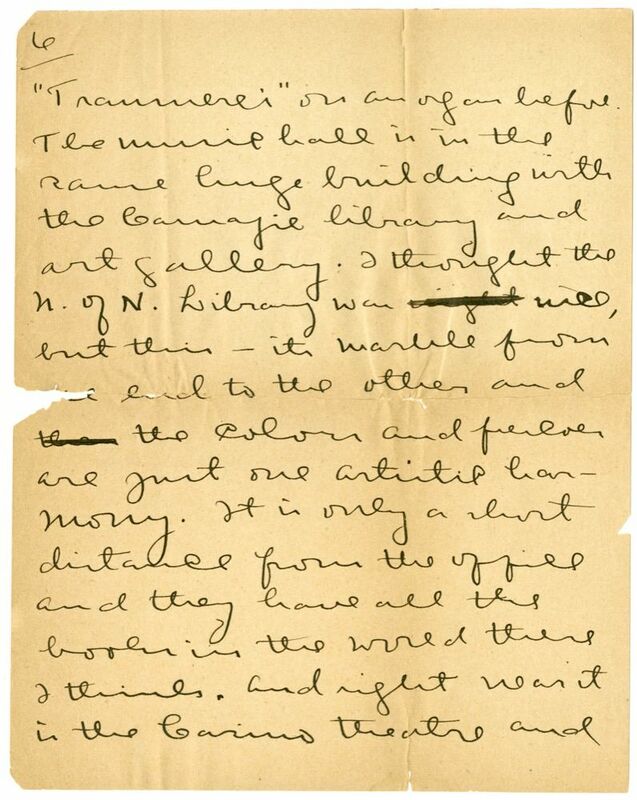 As Cather dates this letter "Monday" it was most likely written on June 29, 1896. The Axtells attended the Cumberland Presbyterian Church on Shady Avenue, established by Reverend Philip Axtell, James W. Axtell's father. The Cumberland Presbyterian denomination has a socially progressive tradition, including being the first to ordain a woman (1889) and the first to ordain an African American (c. 1830). 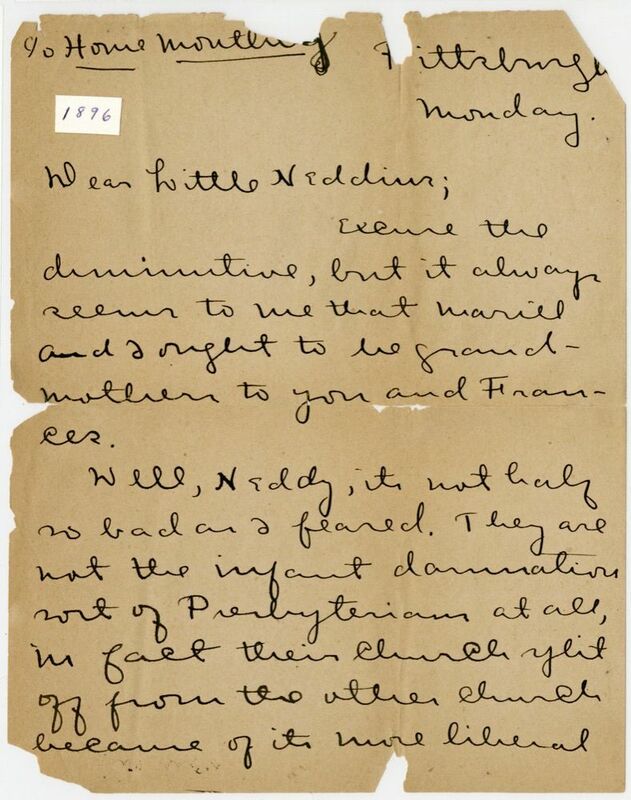 During the Great Revival of 1800, the Cumberland Presbyterians rejected the doctrine of election and reprobation in the Westminster Confession of Faith, and issued a statement in 1813 dissenting in regards to infant damnation, predestination, and eternal reprobation. Although they began college the same year, Fanny Rush graduated from Bryn Mawr College in 1901, while Lida Axtell graduated from Vassar College in 1902. Cather was a regular contributor to the Nebraska State Journal and held various positions on the editorial staff of The Hesperian while she attended the University of Nebraska. Built in 1896, the Casino Theatre was located in Schenley Park in Pittsburgh, PA.
Axtell, Mary Helen Minor (1854-1926) (“Nellie”). Cather’s Pittsburgh acquaintance. 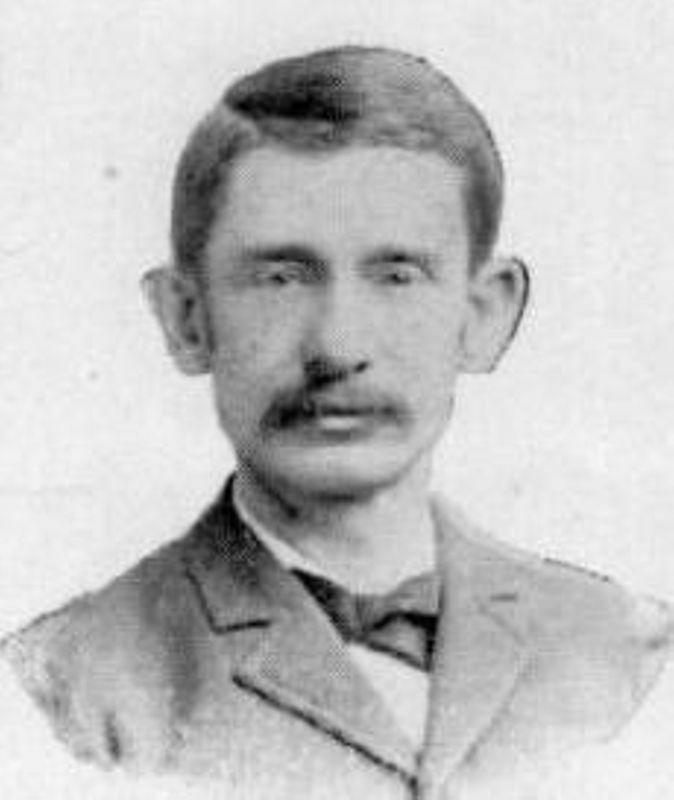 Born in Waynesburg, PA, the third child of Henry Minor and Mary Phillips Minor, Mary Minor graduated from Waynesburg College in 1872 and married James W. Axtell in 1874. Their first daughter, Clara, was born before the Axtells moved to Pittsburgh in 1877, where Clay, who died in infancy, and Philip were born. Cather stayed with the Axtells when she first moved to Pittsburgh in 1896 to work for Axtell and Orr’s Home Monthly magazine. Mary and James Axtell relocated from Pittsburgh to Nashville, TN in 1899. At the time of her husband’s death in 1909, they were living in Lincoln, NE, with their daughter, Clara Axtell Poynter. Mary died in Nashville, TN. Poynter, Clara Eliza Axtell (1876-1952) (“Lida”). Cather’s Pittsburgh acquaintance. Born in Waynesburg, PA, to James W. Axtell and Mary Helen Minor Axtell, Lida Axtell graduated from Vassar College in 1902. 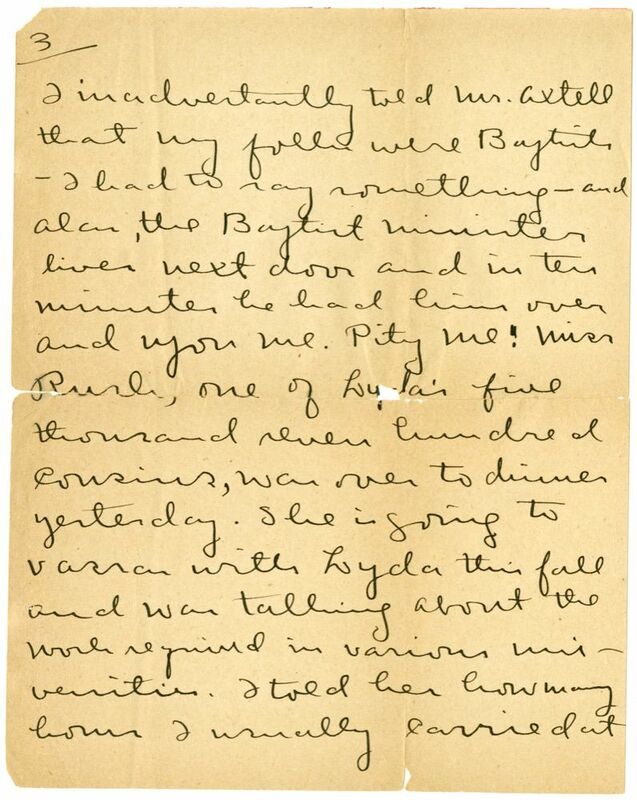 When Cather stayed with the Axtells in Pittsburgh briefly in June 1896, Lida was visiting her aunt, an absence Cather claimed was a ploy to keep Lida away from Cather’s “contaminating influence” (#0025). By 1900, the Axtell family had moved from Pittsburgh to Nashville, TN, where Lida Axtell married physician Charles William McCorkle Poynter in 1907 and moved with him to Lincoln, NE. After the birth of their daughter Helen in 1913, the Poynters relocated to Omaha, NE, where Lida remained until her death. Crawford, Frances Bertha Rush (1877-1956) (“Fanny”). Cather’s Pittsburgh acquaintance. Born in 1877 in Pittsburgh, PA, the second daughter of John Rush and Mary Axtell Rush, Frances Rush received a B.A. from Bryn Mawr College in 1901. 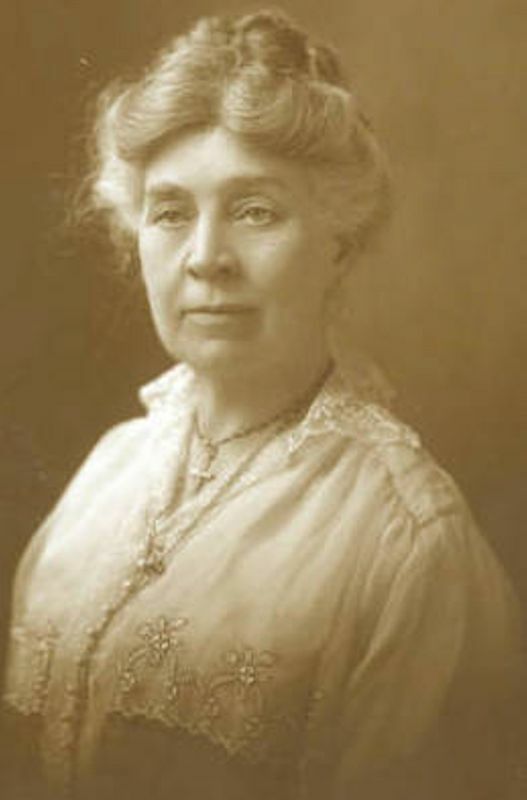 In 1902 she became treasurer of the Bryn Mawr Club of Pittsburgh. Fanny married Judge Remembrance Lindsay Crawford in 1904, and they had five children, Elizabeth, Mary, Katherine, David, and John. By 1950, Fanny had moved to Arlington, VA, where she remained until her death. 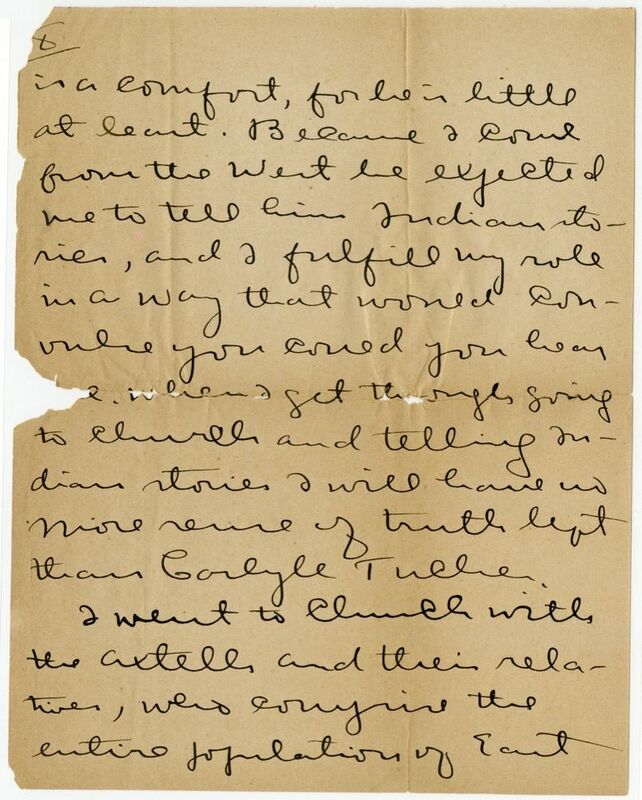 Cather met Fanny through her cousin, Lida Axtell, when Cather was living in Pittsburgh and working for the Home Monthly, describing Fanny and her sisters as “three tall, plain, stiff, prim, Presbyterian Miss Rushes” (#0026). Archer, Frederic (1838-1901). British composer and organist; director of Carnegie Music Hall in Pittsburgh. Born and educated in England, Frederic Archer moved to Pittsburgh, PA, where he was the city organist, the director of Carnegie Music Hall, and the conductor of the Pittsburgh Symphony Orchestra. 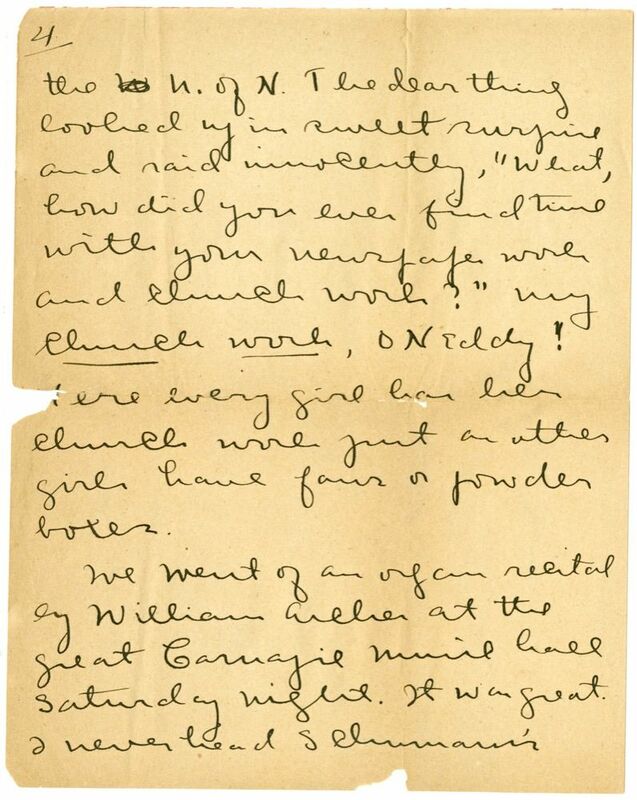 He gave over 400 public organ concerts at Carnegie Music Hall, one of which Willa Cather attended on June 27, 1896. 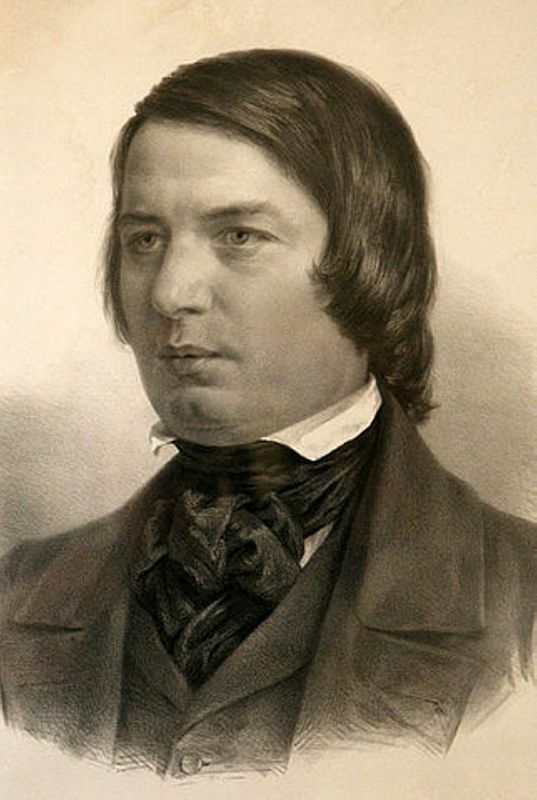 Schumann, Robert (1810-1856). German composer and music critic. Born in Zwickau, Germany, at seventeen Schumann enrolled as a law student at the University of Leipzig but left in 1829 to pursue a career as a concert-pianist. After injuring his hand, Schumann pursued composing. In 1834 he founded the periodical, Zietschrift für Musik. In 1840 he married piano virtuoso Clara Wieck Schumann. Clara continued to work throughout their marriage and supported Schumann’s career financially and intellectually. Known primarily as a Romantic composer for piano and orchestral music, his best works include Carnival (1833-35), the Davidsbüdler Tänze (1837), Kinderszenen (1838), and the Piano Quintet in E-flat Major (1842). Schumann struggled with mental illness and spent the final years of his life confined to a mental institution. Cather alludes to Schumann and his works in Alexander’s Bridge (1912) and The Song of the Lark (1915). Hall, Pauline Fredrika Schmidgall (1860-1919). American singer and actress. Born in Cincinnati, OH, Pauline Schmidgall began her stage career in 1875 as a dancer. 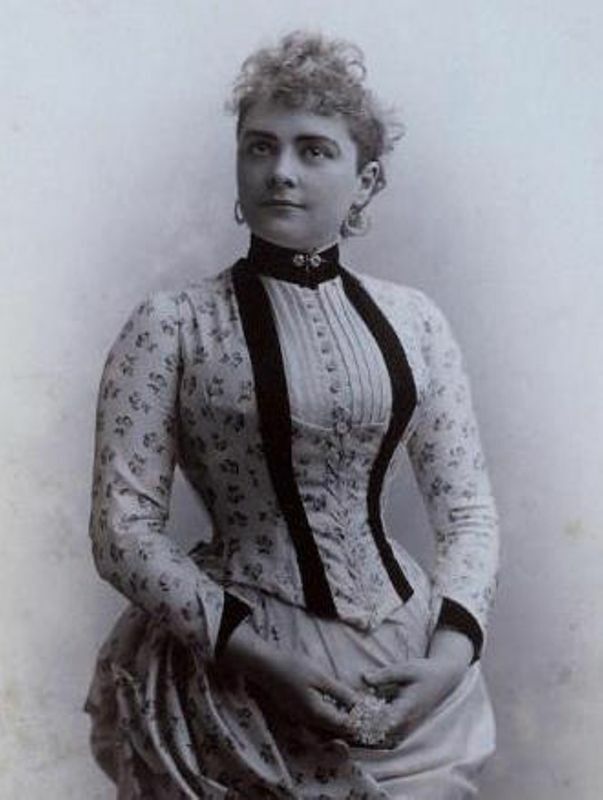 She toured with actress Mary Anderson in legitimate drama, then in 1880 joined Edward Rice’s company, where she performed both male and female parts in operetta. Her biggest hit on Broadway and on tour was in Erminie (1886-88). In 1890 Hall formed her own touring company; Cather saw her perform in Lincoln, NE, on several occasions, and in 1894 defended Hall vigorously when she was attacked by a minister in Sioux City, IA. In The Song of the Lark (1915) the Moonstone Orchestra plays selections from Erminie (book I, ch. 8) at a town concert, and a picture of Pauline Hall in tights is mentioned (book II, ch. 11). Axtell, Philip Phillips (1885-1928). Cather’s Pittsburgh acquaintance. 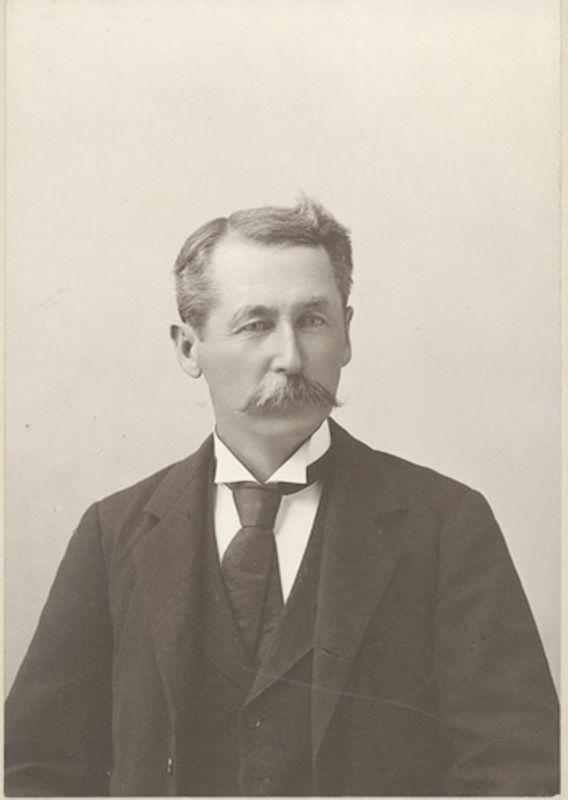 Born in Pittsburgh, PA, to James W. Axtell and Mary Minor Axtell, Philip Axtell moved with his family to Nashville, TN, in 1899 where he graduated from Nashville’s Wallace University School, a preparatory school, and enrolled at Vanderbilt University in 1905. Philip Axtell left Vanderbilt without graduating and went into business with the Baird-Ward Printing Company. He married Valery Trudeau in 1912 and had two children, Philip and Valerie. Philip Axtell died in Nashville. Tucker, Carlisle F. (1875-1941) (“Carl”). Cather’s university classmate. Born in Massachusetts to Francis C. and Emily Tucker, Carlisle had three brothers and one sister, Louise. The family moved to Lincoln in the early 1890s, where his father was an engineer for the Burlington Railroad. 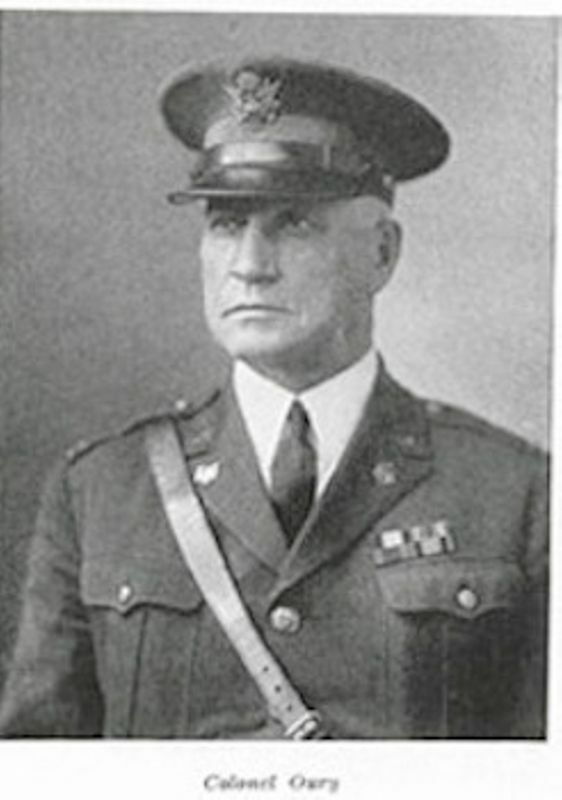 Carlisle attended the University of Nebraska with the class of 1895 but did not graduate. In 1896 Carlisle was teaching music in Lincoln, but the family apparently left Lincoln soon thereafter. 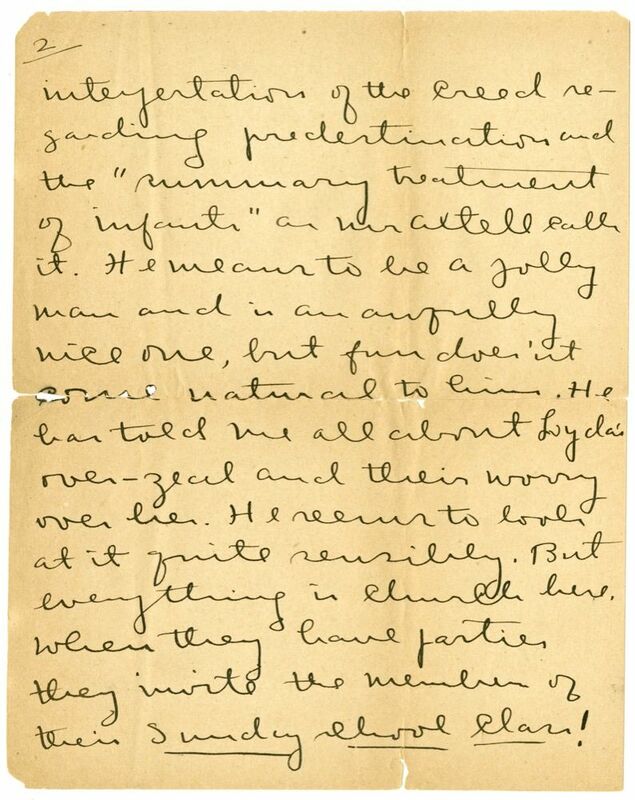 Cather mentions Tucker in her review of a student performance of classical plays in 1894.